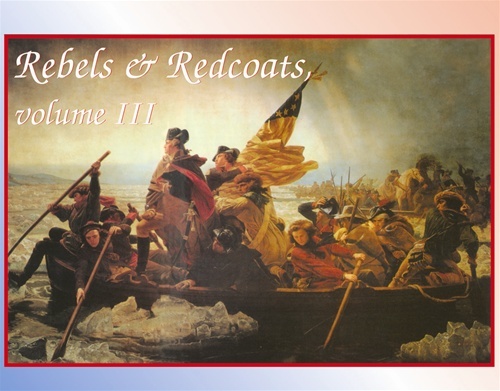 Rebels & Redcoats, All Vol. Nineteen battles from the American War of Independence are included in three volumes. The easy game system recreates battlefield conditions with a move-fight-rally play sequence to simulate the grand tactics of these battles. Additional rules include command control, morale, artillery, light infantry, and dragoons. 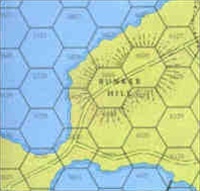 Each battle is represented by its own units and map along with exclusive rules to recreate the unique battlefield situation. Units are generally regiments, and rated for combat strength, morale, and march capabilities. Famous leaders are also included-Washington, Howe, Greene, and Knyphausen. Battles range from Bunker Hill, through Brooklyn and Trenton, to Saratoga and Monmouth, and on to the South at Cowpens, Guilford, and King's Mountain. Volume III: The New York Campaign Brooklyn (27 Aug 1776). Howe moves his forces onto Long Island and uses a long flanking march to get behind the advance American forces, but does not follow up his victory with an assault on the American main line. Fearing a naval trap, Washington retreats his forces to Manhattan. Harlem Heights (16 Sep 1776). After positioning new lines at the neck of Manhattan, the British move onto Manhattan and take New York City. On 16 September, an American foraging party runs into a British scouting force and a skirmish begins. Both sides begin sending forces into the developing battle. The Americans push the British back two miles nearly reaching the British camps before being stopped. The American morale, flagging after the defeat and retreat from Brooklyn, was restored. Still, the growing British threat to outflank the Americans forced Washington to fall back. White Plains (28 Oct 1776) Historically, the battle ended after a lengthy skirmish on Chatterton Hill between a mixed force of British and Hessians versus American militia and regulars. The slow moving British prepared for a battle three days later, but by then Washington had retreated further north to cross the Hudson River and head south to New Jersey. Howe decided not to pursue and instead seized Ft. Washington. However, there are accounts that suggest that Howe might have assaulted the main American line immediately. Trenton (26 Dec 1776). Washington conceives of a bold move to cross the Delaware River and surprise the Hessian outpost in Trenton as a means to gain a victory, and turn the morale of his troops. After crossing the Delaware and marching for several hours in snow and sleet, the force divided into two columns in an effort to surround Trenton, and cut off retreat and reinforcement. The Hessians had no expectation of a surprise attack, and partied late into Christmas night. The American columns managed to emerge almost simultaneously on the few pickets, overwhelming them, and moving in and around Trenton as the Hessians scrambled to defend themselves. In less than two hours, almost the entire 1,400 man garrison was bagged. Princeton (3 Jan 1777). At the end of 1776, Washington was facing the imminent departure of most of his remaining force. He makes a plea for men to stay on for six more weeks for an additional bounty and was able to pull together 5,000 troops. With these, he crossed the Delaware River into New Jersey again. Sidestepping the British forces marching to Trenton along the main road, the Americans make a back road march towards Princeton. Sending a force to guard a bridge over the main road to slow a British response, this force runs into a trailing British regiment. A battle ensues in a nearby field. The fast marching Americans defeat the British forces, capture supplies at Nassau Court House, and march on to Morristown to winter quarters, but loss Gen. Mercer. Stony Point (16 Jul 1779). Wayne's surprise attack on the Hudson River fort. The Americans went in with only bayonets and cutting equipment. They managed to capture nearly 500 of the 600 man garrison. King's Mountain (7 Oct 1780). The rebel militia avenge their defeat at Camden with a decisive defeat of the Tories, ending Cornwallis' attempt to conquer the Southern colonies until the following year. Also includes all material from Rebels & Redcoats Volume I and II. All this comes in one 2 inch box. Components, Vol I: 440 counters, (2) 22" x 34" mapsheets, 2 player aid cards, 16-page rule book. Components, Vol II: 360 counters, (2) 22" x 34" mapsheets, 2 player aid cards, 16-page rule book. Components, Vol III: 560 counters, (2) 22" x 34" mapsheets, 2 player aid cards, 16-page rule book. Copyright © shop.decisiongames.com. All Rights Reserved.